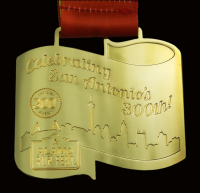 It's San Antonio's best Half Marathon route, plain and simple! Have a great time on this fast course through the streets of downtown San Antonio, passing numerous iconic and historic landmarks. And then it’s onto beautiful Fort Sam Houston for 6 miles before eventually finishing back INSIDE the Alamodome at center floor! The event will again be both Sanctioned and courses Certified, USA Track & Field so as always, you can be assured you are running a true 13.1 miles at the Alamo Half! Fluid replenishment stations with plenty of water and electrolyte replacement drink - a total of 10 stations - will be set up at regular intervals throughout the course (see 2018 course map). The Alamo Half is chip timed. Plenty of energized volunteers along the route will lift your spirits and help motivate you towards the finish line. San Antonio loves champions… and every participant in the Alamo Run Fest is one! Registration for the event will automatically cut off once limit has been reached. You must be pre registered by end of day 3/8/19 to have a shirt reserved for you to pickup at the Alamo Expo. Although our projections for late registrations are close and we do order extra, they are projections so you run the risk of having it mailed after the event if we run out. A small online processing fee is added at check-out by our online registration provider, RunSignUp. 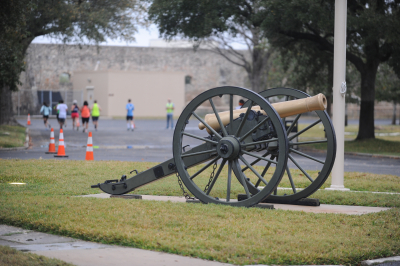 Active Duty Military and their dependents can receive a 20% discount on entry to the Alamo Half. The 2018 ALAMO HALF Finisher Medal! For safety reasons and the fact that USATF insurance does not cover bicycles, skateboards, scooters, pets, roller skates, inline skates or roller blades, they will NOT be permitted on the course. 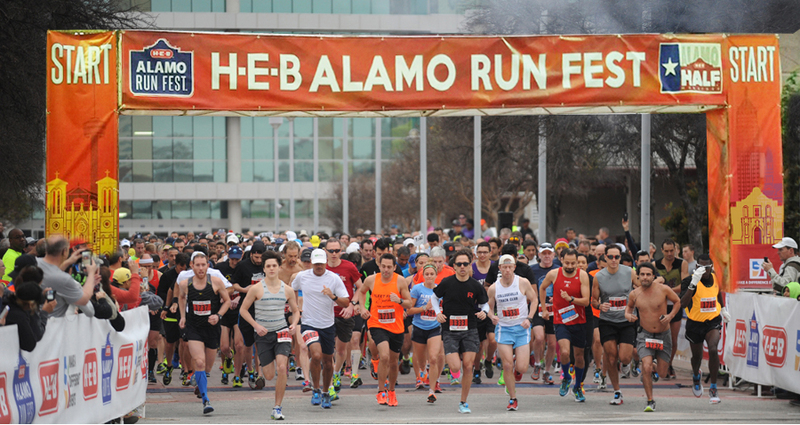 Recumbent bikes, Baby joggers and strollers are NOT permitted in the Alamo Half event. Firearms (concealed and/or open carry) are NOT permitted in the event, on the event route, or within any of the associated event venues (Alamodome, North Plaza, etc.). The half marathon course will remain open for 4 hours and 15 minutes , from when the last runner has crossed the START line during the regular Official ‘starting period’ for the event. Any runners arriving and starting after the official start will be governed by the course closure times established during the official start of the Alamo Half marathon event, as described above. 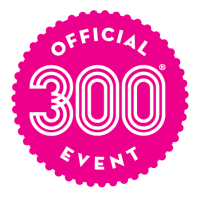 This means Alamo Half participants must start with the Alamo Half event for the maximum pace per mile guidelines to apply. We will have a rolling closure of the course - as described in this website - which is based on an approximate pace of 19 minutes per mile starting when the last runner crosses the start line during the 'Official Start'. There is a 'gate' at approximately mile 3.8 that will be closed entering Fort Sam Houston, should you not be maintaining at least the 19 minute pace, and you will be re-directed back onto the Alamo 10K route. 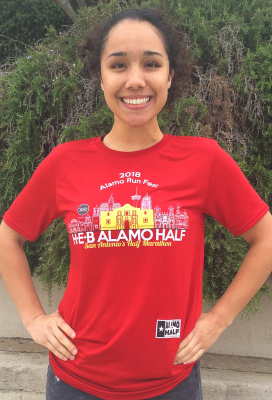 Minimum age for entry to the Alamo Half is 12 years of age, on the date of the race. In some special cases, this age minimum may be waived, at the sole discretion of race management. For consideration of a waiver of the minimum age for entry, please contact race management at [email protected] and please to include 'Age Waiver Request' in the Subject line. Someone from race management will then be in contact with you to determine if a waiver may or not be issued. Each potential waiver request case is handled individually and race management reserves the right to make the final determination.